Battery life is the very important factor we need to consider while purchasing any android devices. And, knowing how your device performs against other devices is also important. For that, an app called “Battery Compare” will definitely help you in that department. It is really a very good indicator that informs you how well your device battery fares among other devices. Preferred settings like Power Saving, the use of Custom ROMs and frequent heavy use of the device may be some of the reasons why your friend who has the same device seems to have his device’s battery drain a lot faster than yours. How Battery Compare app works? Battery Compare has three tabs on its main screen: Benchmark, Publish and Compare. This tab lets you to get valuable information about your device’s battery, more like obtaining metrics about your battery for it to be compared to others later on. This process usually takes about an hour, so the app tells you to go about your day as it records information. You have the option to set the app to stop the benchmarking process automatically after one hour or you can do the same manually when you want. 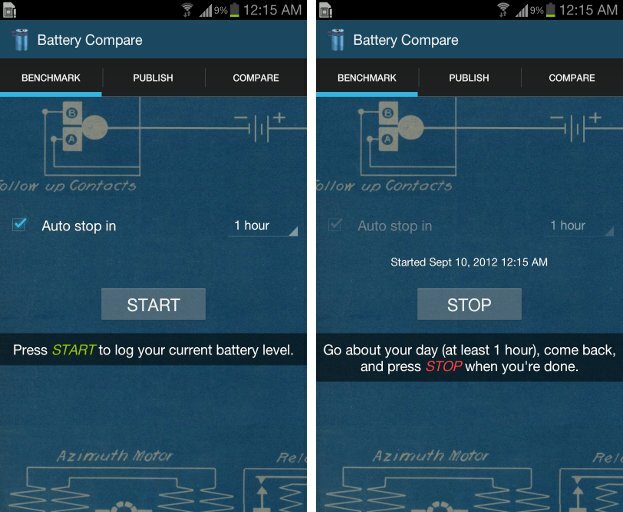 After benchmarking is done, its head on to the Publish tab to set some minor tweaks to your device’s battery. In this tab, you will get more information about your battery. Usage level (light, moderate or heavy) and other relevant information about your batteries performance against other device’s batteries will be provided. Useful data’s like your device’s battery type, current OS, manufacturer and more will be presented. Once you got the all needed information tap the Publish button so that you can proceed to the next tab. This tab shows all the results of the comparisons and benchmarks done by the app in terms of percentage. Filters are also provided in this tab you can make use of that and it will display the results according to your preference like by duration, models, battery age, OS Versions and more. If you want to see the results according to the device model (e.g Samsung Galaxy Note), then the app will only show you battery comparisons that span only the same device model you currently have. 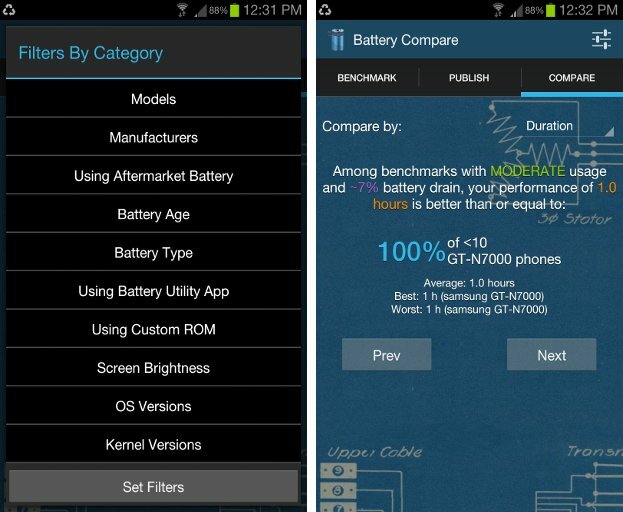 With all the information you get from this benchmarking tool, you will get the idea of how well or how poorly your device’s battery is performing. Based on that you can buy a better android device based on battery wise. You can download the Battery Compare from the Google Play Store at no cost. It also has a pro-version where you can reload recently saved benchmarks for comparison.